Our surgical suite allows us to perform a variety of surgeries. Some examples are spays and neuters, wound repairs, lump removals, cystotomy (bladder surgery), gastrotomy or enterotomy (stomach or intestinal surgery), and orthopedics (fracture repairs, ligament injuries such as an ACL tear). For more specialized orthopedic surgeries, a mobile board certified surgeon can come to the Renfrew Animal Hospital. There are certain surgeries that we are able to perform with local anesthesia (freezing) instead of general anesthesia, such as some lump removals and suturing wounds. In animals, dentistry is considered surgery as even dental cleanings require our pets to be under general anesthetic. Not only do we perform dental extractions in addition to dental cleanings. For your pet's safety, we utilize electronic monitoring equipment and have a dedicated surgery technician to monitor your pet while they are under general anesthesia. 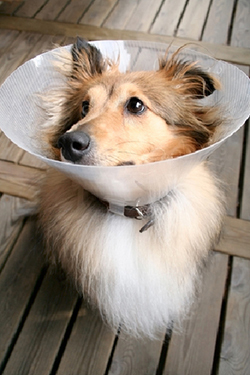 Your pet will often go home wearing one of these annoying (but usually very necessary) e-collars! E-collars prevent your pet from licking and chewing at his/her incision; they are also used to prevent your pet from pawing or scratching at his/her face if surgery was performed in this area.